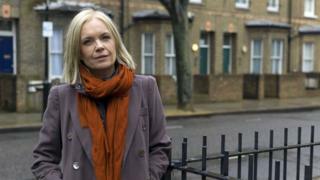 Mariella Frostrup says she can comment on men's appearances "without too much fear of censure"
Broadcaster Mariella Frostrup has complained of a new "double standard" that allows women to lust over men - but sees accusations of sexism arise when the role is reversed. The presenter of BBC Radio 4's Open Book reveals her concern when writing about the new TV series of Poldark in the Radio Times. She says she can comment on a "shot of a shirtless, sea-soaked Aidan Turner".But men would not be able to remark similarly on his female co-stars. "As a woman, I can own a comment like that without too much fear of censure," said Frostrup. "Indeed, there's an undeniable sense of celebration among my girlfriends at the return of this sultry, tormented character, embodied by a delectable young thespian pleasing all viewing generations. "But we live in confusing times and I'm the first to admit to double standards - if a male colleague had penned those preceding lines about any of Turner's equally appealing female co-stars, his cries of contrition would be drowned out by Twitter's Troll Chorus." The presenter said she feared that "we are losing not only our sense of humour but our sense of proportion as we throw every act of perceived sexism into the #MeToo basket. "Frostrup added: "There's an enormous difference between judging a person's worth only on the basis of their physical assets and expressing admiration for a fellow human with God's gift (allegedly) of good looks. "Admiring Aidan Turner should be an acceptable national pastime, as a thumbs-up for the glories of humanity and another for his engaging performance".